340 pages | 30 B/W Illus. 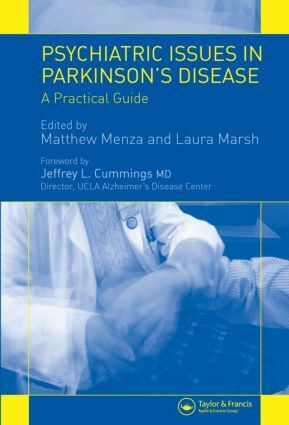 A practical guide to the management of various clinical issues seen in patients with Parkinson's Disease (PD), this text emphasizes the need for coordinated care between the various professionals, as well as between professionals and caregivers. Providing an update on current developments in the neurology and management of PD, as well as the understanding and treatment of non-motor aspects of PD, the book also includes a variety of topics such as depression, psychosis, and anxiety. "This is an extremely useful new book focusing on the nonmotor complications of a common disease entity, Parkinson disease (PD). Written and edited by clinician-researchers in neuropsychiatry, this is a helpful guide for clinicians who treat the behavioral, cognitive, and psychiatric manifestations of this disease." "Indeed, the editors and chapter authors have succeeded in making an accessible and practical guidebook for the care of patients with this disabling disease." "This is an excellent and unique new book for the care of patients with PD. Clinicians who treats patients with PD are doing their patients a disservice if they are not aware of the information this useful book provides." Matthew Menza, MD, is Professor of Psychiatry and Neurology, and Acting Chair of the Department of Psychiatry, University of Medicine and Dentistry of New Jersey, Robert Wood Johnson Medical School, Piscataway, New Jersey, USA. Laura Marsh, MD, is Associate Professor of Psychiatry and Neurology, Department of Psychiatry and Behavioral Sciences, Johns Hopkins University School of Medicine, Baltimore, Maryland, USA.